It would be wrong to take the denials of a potential one-on-one meeting, from both the White House and from Iranian officials, at face value. In the United States, President Obama does not want to appear too willing to engage in direct talks with Iran, at least until the election is over. In an effort to appear tough and unrelenting, on Sunday allies of the White House suggested that if the reports are true, it’s because the onerous sanctions and diplomatic isolation of Iran orchestrated by the Obama administration since 2009 are working. “For two years, the president traveled the world putting together a withering international coalition, and now, the sanctions that they agreed on are bringing the Iranian economy to its knees,” said David Axelrod, top political adviser to the president’s reelection campaign. But, as others have pointed out, it’s unlikely that Iran has caved under pressure. Though sanctions have severely undercut Iran’s oil exports and helped spark a collapse of Iran’s currency, the rial, this month, most analysts believe that Iran can weather the economic storm for months or even years depending on the size of its foreign currency reserves, which can be used to stave off a balance-of-payment crisis. Despite the economic, pressure, there has been very little sign of political unrest inside the country, and in any case, the regime in Tehran has the capacity to suppress unrest should it develop. So, if Iran has agreed to direct talks with the United States, it’s probably because the United States has unofficially told Tehran that it is willing to make the concessions needed to get a deal. Romney did not immediately comment on the report of possible U.S.-Iran talks, even though in the past he has called the idea of talking directly with Iran “naïve.” Rob Portman, the senator from Ohio who is helping Romney prepare for Monday night’s debate, didn’t directly oppose the idea of talking to Iran, but he did say that the report is “another example of a national security leak from the White House.” That’s a sign that the Romney campaign is uncomfortable with rebutting or directly criticizing the proposed talks, since were he to do so the White House might portray Romney as a proponent of military action rather than diplomacy. 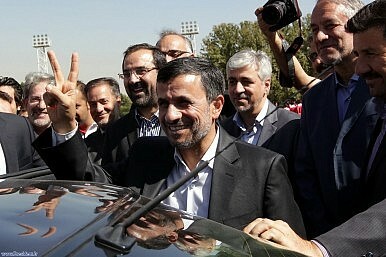 For Iran, the idea of talks with the United States after the election is a no-lose proposition. If Obama wins, the stage could be set for the first real bilateral negotiations between the two countries since the start of the cumbersome talks involving Iran and the P5+1 world powers. If Romney wins, it will be harder for the new Republican administration to gear up for military pressure on Iran – including the buildup of U.S. forces in the Persian Gulf and closer coordination with Israel – if Iran has signaled its willingness to negotiate. Still, if Ayatollah Khamenei has quietly given his blessing to talks with the United States, he’ll have to deal with hardliners of his own. As many analysts, including Karim Sadjadpour of the Carnegie Institute in Washington have argued, the Supreme Leader has long based his political popularity on refusing the negotiate with the United States. Were he to reverse that position so dramatically, he’ll have to work hard to persuade, cajole and intimidate both allies and opponents who disagree.